Weighbridges provide great facility in weighing. The double ended shear-beam loadcells specially designed for weighbridge applications provide the best results. These can weigh horizontal as well as vertical load components. Weighbridges are available in various types. There are mainly Pit-type and Pit-less type of weighbridges. 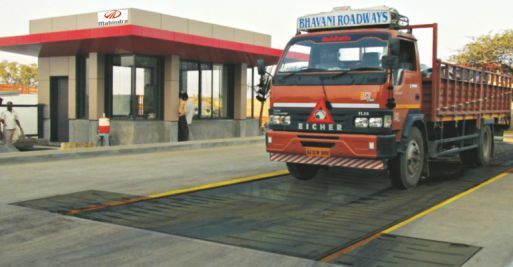 Orthotropic U beam weighbridges are very useful for weighing large-sized Indian trucks. Instead of the traditional I-beam, U-beam is used in this type. Decks with various stiffness’s in longitudinal and transverse bearings are called ‘orthotropic’. This type is an imaginative development for weighbridges that offer wonderful auxiliary qualities. This type comprises of a structural steel deck plate solidified either longitudinally or transversely. These weighbridges are cost-effective and they have higher pressure bearing quality and higher life expectancy. They have a robust construction and are efficient to directly bear vehicular loads. Pit-type weighbridges have a sturdy and strong mild steel platform which is a safeguard against lateral and sway movements. It is flushed to ground level and is extremely suitable if there is a space limitation. No ramp is required in such type of weighbridge. Platform of Pit-less type weighbridges is also strong and sturdy and prevents lateral and sway movements. This type is surface mounted and hence economical. Maintenance of this type is easy as the platform is completely above ground level. There is no high-water table or drainage problem in this type. This type has to be approached by low angle ramps. Electronic Weighbridge terminal is specially designed to withstand all environmental conditions prevailing in weigh cabin. It has keyboard interface for making entries easily. The terminal is equipped enough to provide detailed print ticket without using a PC. The entire set is compact and convenient. Weighbridge kit is a highly sophisticated machine that enables in-house digital loadcell cornering and digital calibration at full capacity of a a loadcell, avoiding manual labour required to lift and place the weights physically at each corner of the platform for cornering and calibration. this saves a lot of hidden cost. Variety available in weighbridges facilitates every type of weighing requirement of heavy loads. Thanks for sharing , Keep up the good work.